This is a make or break moment for Bitcoin. The world’s leading cryptocurrency and reserve digital token is trading above $4,100 and looks like it could higher. It also looks like it might top out at this level so patience is the name of today’s game. The BTC/USD may be gearing up for a big move higher and I think it is but until it clearly breaks resistance, closes above it, and holds that level I’d be wary. The cryptocurrency market is waking up, has woken up, but that does not mean a massive rally is going to happen NOW. It may, but like I said, I’d need to see a good clean break of resistance before adding to any bullish positions. Until then it may be wise to trim profits if you have them, at least tighten stops on any trades you can. Resistance is $4,190, a move above that would be bullish. Stellar is promoting its cryptocurrency network and token, the Lumen, through a free giveaway at Coinbase. Coinbase will give you up to $50 of XLM for watching a few videos, answering a few questions, and asking a few of your friends to join. 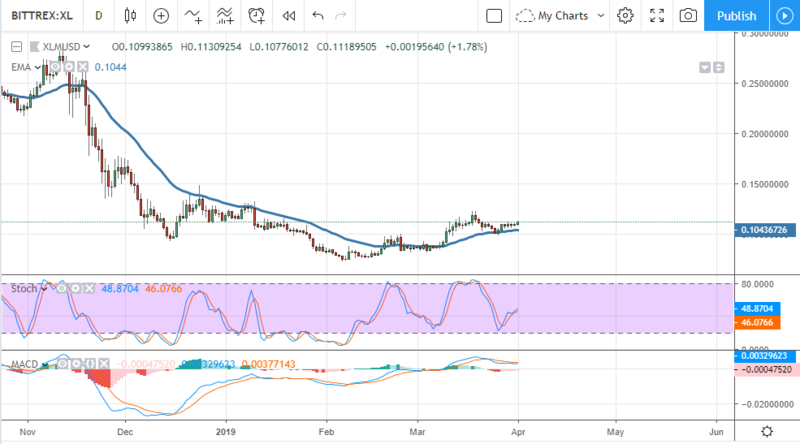 The XLM/USD is now trading at a +2 week high following a bounce from the short-term moving average. The move looks bullish and extends a consolidation zone that may lead to higher prices in the short and long term. The indicators are mixed but consistent with an upward swing in prices so a retest of the recent high is expected. At least. The Basic Attention Token, an ERC-20 protocol coin, is one of the hottest coins this year. 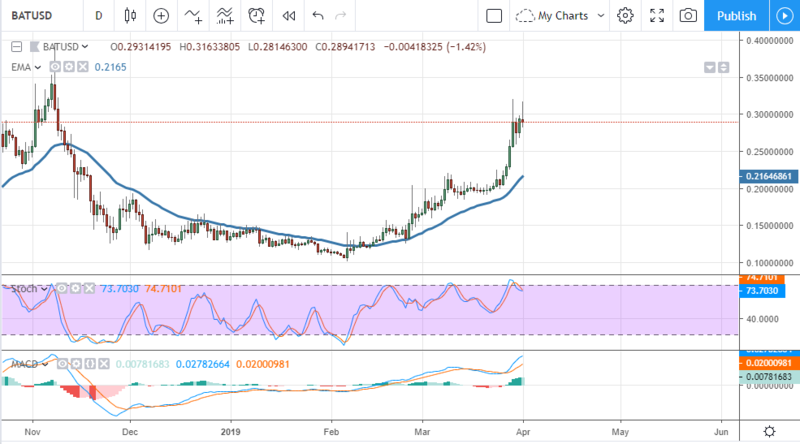 the token is up more than 200% from its 2019 low and looking strong. The reason for this strength is simple, the BAT token and Brave Browser it supports have true utility. Utility is the factor lacking from most cryptocurrencies and why the market is having such a hard time bouncing back from last years rout. In the meantime, look for the BAT/USD to continue testing resistance near $0.30, once that breaks look for a move up to $.50 and $0.60 before an eventual retest of the $1.00 level. Currently sitting in the 5th spot by market cap Litecoin is quietly rising in price and rank. The original “light” version of Bitcoin LTC is finding better acceptance among cryptocurrency HODL’ers. One reason is the stable network. Litecoin is not without issues mind you but it doesn’t have the problems seen by Bitcoin (fork after fork after fork) or the instability of Ethereum (still can’t issue and update/upgrade that’s been promised for two years). 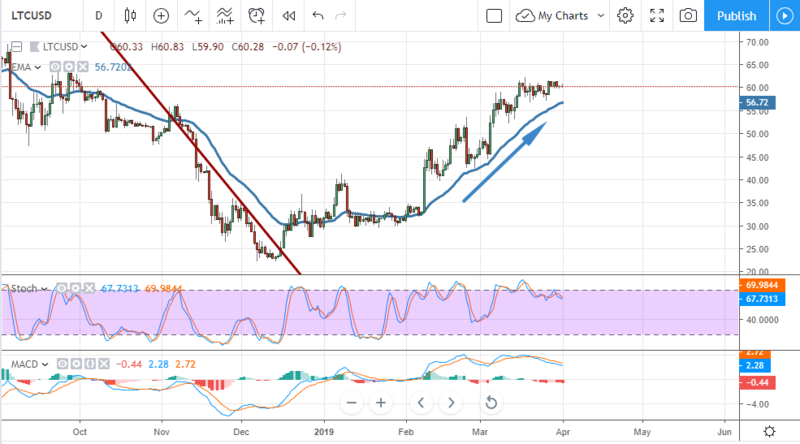 In this environment I expect to see LTC/USD move up to the $100 in the near-term. 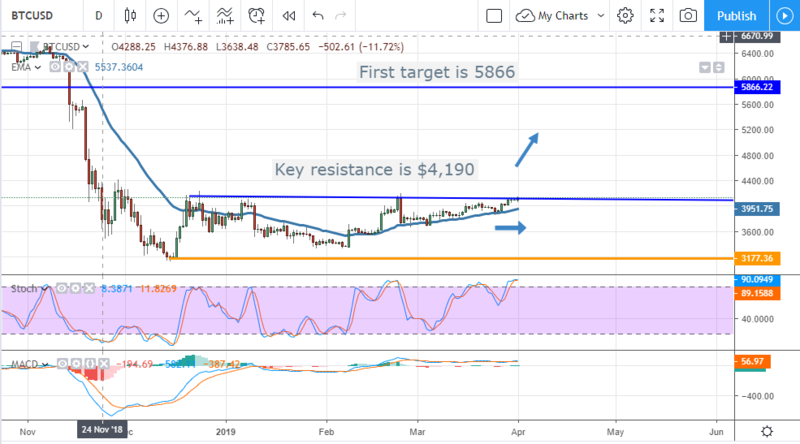 The token is currently fighting resistance at the $60-$62.50 level, a break above there would be bullish.